The cafe is located in what was for a long time the cafe De Clieu and the fit out is really lovely. Gorgeous vintage pendant lights, amazing green tiles, it was a really welcoming place to sit and eat. 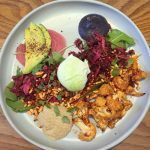 The menu is not overly long, and is the same for both breakfast and lunch, with more savoury than sweet options (which suits me perfectly!). There’s quite a few veg friendly options too which is always important! So, what did we order?! 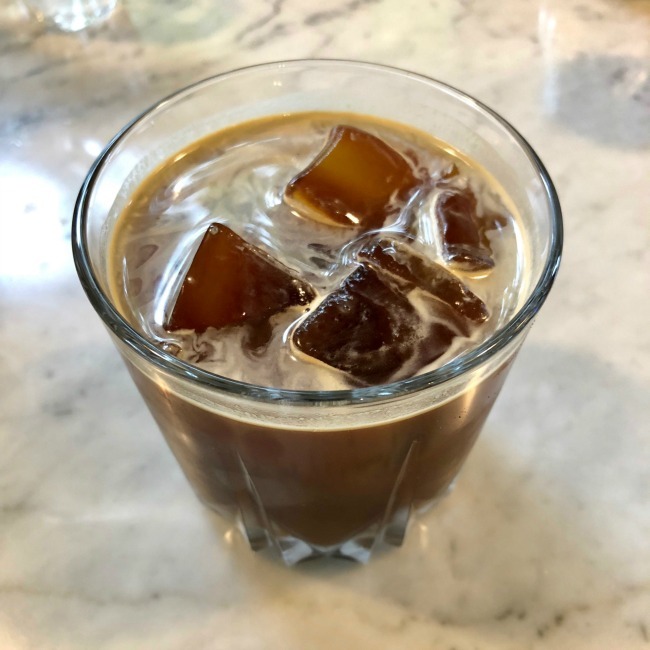 It was a warm, humid morning so I went with my favourite summer option – an iced long black ($4). The coffee is from Inglewood Roasters and it was seriously excellent. My sister had a long black as well and she also thought it was fantastic, so we were off to a good start. We decided to order the two dishes that were jumping out at both of us and share them, which turned out to be a very good plan – no ordering envy for us! 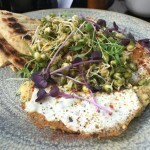 The first was the sambal scrambled eggs ($18) which was served with feta, herbs and nigella seeds on sourdough. 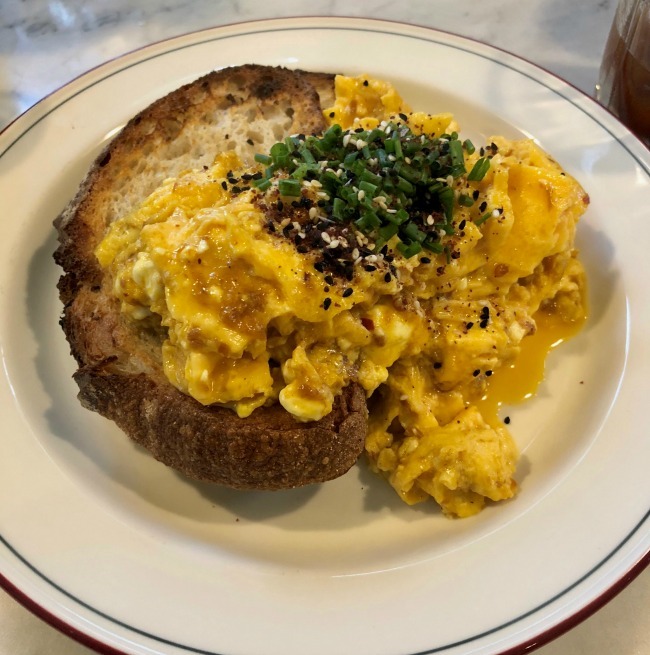 These were some of the best chilli scrambled eggs I’ve had in a long time. The eggs were fluffy and perfectly cooked, and the chilli was strong without being overpowering. I particularly loved that the sambal was throughout the eggs so the chilli flavour was consistent, rather than the chunks of chilli you can often get in these kinds of dishes. The herbs and nigella seeds added some excellent crunch and flavour too, and it was all round a winning dish. 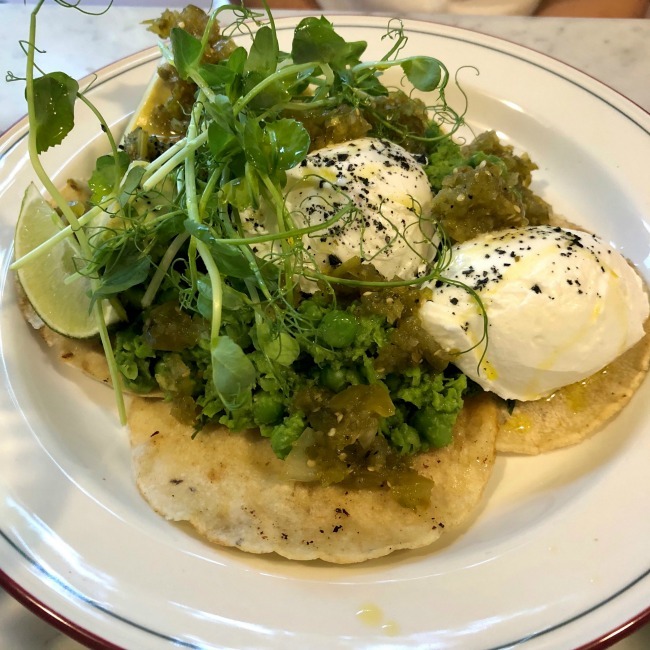 Our second dish was the tortillas with spiced peas, tomatillo, jalapeño, goats curd, avocado and a poached egg ($20). This was such an interesting and delicious breakfast choice. The combo of the spicy peas and jalapeño with the creamy goats curd and avocado was excellent, not to mention the fresh lime. The tortillas were a little hard to cut for us to share, but in the end we just ditched the cutlery and used our hands! We were so happy with our choices, and I would happily eat both of these dishes again and again. 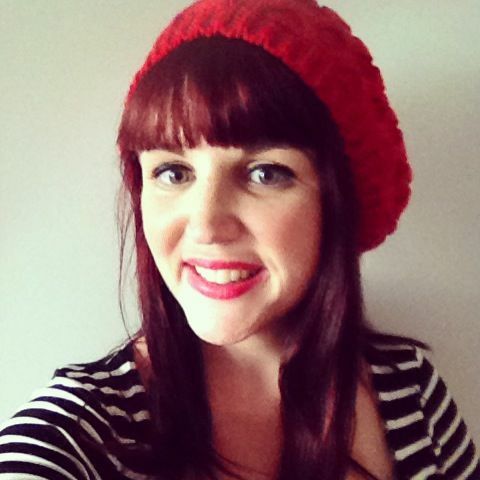 Gabriel is open 7 days a week, from 7.30am weekdays and 8am weekends. It’s not a huge cafe so seats are limited, although in good weather there are a number of tables outside as well. The staff were friendly and attentive and we were able to split the bill which I always appreciate. I definitely recommend a visit! 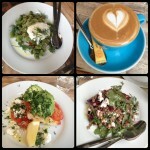 Have you been to Gabriel in Fitzroy yet? I recommend giving it a try!